The Manitoba Nursery Landscape Association (MBNLA) brought landscape professionals and suppliers together in Winnipeg for networking and education this past February. Wendy Hofford’s keynote address “Growing pains and hiccups: Turning the side effects of growth and change into success” led off, bringing energy and excitement for the busy day ahead. With five seminar tracks, 20 sessions and 18 different speakers, there was something for every landscape professional. Topics focused on each landscape sector and general business, as well as the emerald ash borer. Strategically placed breaks provided the opportunity to connect between sessions. Lunch allowed everyone to enjoy a delicious meal together and the chance to take in the 2018 Awards of Excellence winners. The day wrapped up with the Grow Social, a true Manitoba-way to connect. Mixing, mingling and silent auction prizes in support of the Landscape Manitoba Horticultural Foundation culminated the conference. Grow19 is set for Feb. 13, 2019, at the CanadInns Destination Centre Polo Park in Winnipeg. Stanley Black & Decker has acquired tool and accessory companies Irwin and Lenox. Irwin Tools is Huntersville, N.C.-based manufacturer and distributor of a broad line of professional hand tools and power tool accessories. Longmeadow, Mass.-based Lenox has more than of a century of experience in cutting technology. Its product categories include reciprocating saw blades, hole saws, jig saw blades, hand saws, drill bits, portable band saw blades, screwdrivers and utility knives. Based in New Britain, Conn., Stanley Black & Decker is listed on both S&P 500 and the Fortune 500 and is one of the world’s largest providers of tools and storage, as well as the world’s second-largest commercial electronic security company. The company’s portfolio includes: Porter-Cable, Bostitch, Facom, Mac Tools, Proto, Vidmar, Lista, Irwin and Lenox. Paul Olsen, founder of Schomberg, Ont.-based Brookdale Teeland Nurseries, died March 3, 2018. 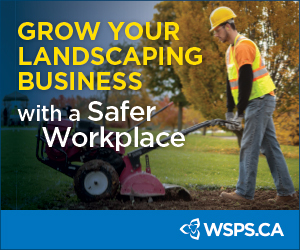 A well-known and prominent supporter of the landscape profession, Olsen was a founding member of both Landscape Ontario and the Canadian Nursery Landscape Association, and served each organization as president (LO, 1996-97 and CNLA, 2007-2009). Olsen was proud that his company was and continues to be a family business. “My wife did the books for the company, starting in 1977 to the late 1990s,” Olsen told Landscape Ontario in a 2016 interview. “It was only the last couple of years she drew any pay.” In 2011, Olsen sold the operation to his son Jeff. Son Peter operates MD Growers in Niagara-on-the-Lake, Ont. while daughter Diane runs the HR department that administers BTN’s 300 peak-time employees. After 25 years, horticultural trade show New England Grows announced it is discontinuing operation. The show’s board of directors made the unanimous decision to dissolve and disband both the event and the organization. Founded in 1993, the Natick, Mass.-based show’s mission was to educate, elevate and support the region’s commercial horticulture industry. Over the course of more than two decades, the not-for-profit organization contributed millions of dollars in educational grants to the industry, as well as to horticultural and community groups like Cooperative Extension, the Horticultural Research Institute, FFA organization, local vocational schools, and the Boston Schoolyard Initiative. Sellick Equipment recently cut the ribbon on a new $21 million manufacturing facility in Harrow, Ont. The new 126,000 square foot purpose built factory was designed for new product innovation, improvement to quality control and flexibility in product design. To ensure higher quality standards, all areas of the manufacturing process were upgraded, including a new machining centre consisting of CNC controlled laser cutting, milling, and turning machines; automated storage and retrieval systems for raw materials and aftermarket parts; and state of the art metal preparation and paint line were implemented to enhance product longevity, Sellick stated in a media release. Nearing 50 years in business, Sellick Equipment produces a wide variety of rough terrain forklifts, each custom built to meet the customer’s application and supported by a dedicated dealer network throughout North America. “Our long term plan is to increase the business through new product,” said president Howard Sellick. “The sky is the limit on what we can produce in this new facility.” Sellick Equipment is a subsidiary of Avis Industrial Corporation of Upland, Ind. Cle Newhook, dedicated industry volunteer and advocate, has passed away after a short battle with cancer. Newhook was a past executive director of Landscape Newfoundland and Labrador Horticultural Trades Association, and a tireless contributor to the horticultural industry. During the signing of a proclamation to establish Arbor Day in Newfoundland, he is quoted as saying, “As leaders, we must also be environmental stewards.” Cle played a leadership role in many areas of his life and will be deeply missed. Winter storms blanketed the Fraser Valley in ice in spells through December and February, racking up thousands of dollars in damages, reports the Times Colonist newspaper. Freezing rain, snow and ice caused power outages and dangerous road conditions across the region, with the worst damage occurring in and around Abbotsford and Chilliwack. Aldergrove and Matsqui Trail regional parks were closed for nearly two weeks while staff assessed the damage and cleared fallen trees and branches. The Times Colonist reports more than 1,500 staff hours will be deployed in the cleanup effort, while tree removal and damages to park facilities has resulted in $12,000 in costs. Charlottetown, P.E.I., city council rejected a motion in February that would have banned pesticide use by professional lawn care companies where there is evidence of infestation. Currently, city bylaws allow for an exemption to the city’s cosmetic pesticide ban when city inspectors determine an infestation is present. Chinch bugs are one of the primary reasons why exemptions are made. City inspectors charge a $50 fee to confirm an infestation diagnosis by a lawn care company. With a planned total investment of $32 million, Milwaukee Tool is proposing another major expansion at their global new product development centre in Brookfield, Wis. A 114,500 square foot, multi-story building would be built on an existing 3.5 acre lot owned by Milwaukee Tool, bringing their global headquarter space to a proposed 504,500 square feet. Over the last several years, Milwaukee Tool has expanded employment at its Brookfield campus from just over 300 jobs in 2011 to almost 1,300. This expansion would lead to the creation of 350 additional new jobs in the next five years. Environmental group fights for pesticide ban in Vernon, B.C. Professional lawn care companies are pushing back after an environmental group lobbied to have a sweeping pesticide ban put on the council table in Vernon, B.C. The Sustainable Environment Network Society presented city council with a petition calling on the body to ban pesticide use in the Okanagan Valley-area town. In February, two local lawn care professions made the case against the proposed ban. Eight provinces already employ “cosmetic” pesticide bans, as well as numerous B.C. municipalities including Coldstream, Salmon Arm, Revelstoke, Lumby and Kelowna. 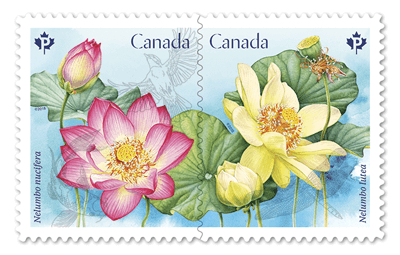 Canada Post introduces the annual flower stamp issue, featuring the American lotus (Nelumbo lutea) and the sacred lotus. The stamps are available in booklets of 10, with five of each design, or coils of 50 offering 25 of each design. A two-stamp souvenir sheet is available for collectors, along with strips of four and 10 stamps from the coil. The American lotus (Nelumbo lutea) has a creamy yellow flower and needs warmth and sunshine. The rare and threatened species grows at its northern limit along the shores of Lake Erie and Lake St. Clair in southern Ontario. It is also found in wetlands in most of the eastern United States and as far south as Honduras. The sacred lotus bears delicate pink and white petals and is the national flower of India. Native to the tropical and warm-temperate regions of Asia and Australia, the sacred lotus is cultivated in North America and can become wild. Takeuchi-US has hired Jeff Stewart as vice president and general manager. In the newly created role, Stewart will oversee parts, service, IT, facilities and non-machine related warehouse operations. Stewart previously been employed in various roles with Takeuchi, spending 13 years with the organization. The position is among a myriad of changes and new hires in the product support area, including Rick MacLeish who recently joined Takeuchi as national parts manager. The hires are in response to record sales in 2017, where there were increases in all areas of the business and business segments, according to the Pendergrass, Ga.-based company.